I am so excited to share with you today's post - an interview with Sarah Glenn Marsh, whose debut, Fear the Drowning Deep, was recently published! 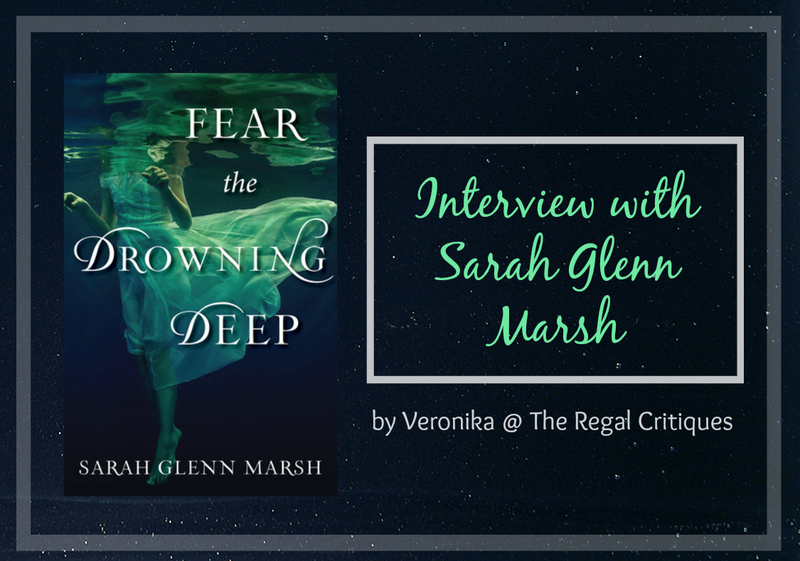 I used to stay far, far away from author interviews, but I actually had a lot of fun coming up with questions for this interview, and then seeing Sarah's answers. If you continue reading, you'll find more information about the novel, its protagonist, and the author herself. 1. Is there a particular message in your novel that you hope readers will grasp? 2. Can you tell us a bit about Bridey, your protagonist? What makes her stand out from other YA heroines? One thing that I think stands out about Bridey is that she shies away from the spotlight even in her own story, and is mainly concerned with protecting her sisters. There’s also a present family in this book, unlike in many YAs where the narrator’s parents are dead or absent, and parent relationships are shown as well as the relationships between Bridey and her three sisters. Bridey is also, of course, a sixteen-year-old girl living in a very different time period from us, and as a result, she sometimes shows her softer side by crying (or at least wanting to cry) when things get challenging—though she still rises to the challenge! While that might be a quality that could annoy some, I think it’s a very realistic view of how someone of Bridey’s station, age, and period in time would react to the situations she faces! 3. If you could spend time as a character from your book who would it be? I’d love to spend some time as Morag, the witch who Bridey apprentices. While she lives a lonely existence, I imagine I’d learn a great deal about all sorts of mythology in her shoes! 4. Fear the Drowning Deep has one of those hauntingly beautiful covers that immediately caught my attention. Do you think that the cover plays an important part in the buying process? Before becoming an author, I might’ve said “no,” to this, but knowing what I do now, the answer is definitely yes! I’ve had many people tell me directly that they were moved to check out the book or became interested in it solely because of the cover. I think a beautiful cover is a powerful marketing tool, and I’m really happy with the way that the cover of Fear matches the overall tone of the story inside! When I’m not writing, I spend time with my four greyhounds: Grimm, Khaleesi, Romeo, & Juliet, and our baby bird, Castle (a Bourke’s parakeet). I also spend lots of time with my husband, playing board games like Pandemic and Seven Wonders, video games like Fallout 4, and computer games like Civilization V. We’ve also been playing a lot of Pokemon Go lately, which has led us to find some great lakes and parks around our home! When not gaming or doing things with the animals, I love to draw or paint, and bake sweet things! 6. Can you tell us one random fact about yourself that usually surprises others? I was an extra in Universal Studios’ comedy Evan Almighty, playing one of Steve Carell’s neighbors! I didn’t have any speaking lines, but it was really fun, and there was always way too much delicious food available to us on set! 7. Have you always wanted to be a writer or were you planning on becoming something completely different when you were younger? The first thing I can remember wanting to be was a paleontologist; I loved dinosaurs! After that, it was marine biologist, then veterinarian. The trouble with those careers is that I’m not remotely math/science oriented, and while my love of animals is real and deep, I didn’t have the strong stomach required to pursue anything vet-related! In college, I earned my Master’s in early childhood education, but my heart was always with writing, even when I didn’t yet realize it! 8. Who is that one author – dead or alive – you’d like to collaborate with on a book (or just chat with)? I’d love to chat or collaborate with the great Neil Gaiman, because I know I’d learn so much from him! He’s truly a master of his craft. The Graveyard Book is one of a very few stories to ever make me openly cry at the end! 9. And finally, can you tell us about what you are working on at the moment? About the Author: Sarah Glenn Marsh writes young adult novels and children's picture books. An avid fantasy reader from the day her dad handed her a copy of The Hobbit and promised it would change her life, she’s been making up words and worlds ever since. She lives in Virginia with her husband and four rescued greyhounds. When she's not writing, she's often painting, or engaged in pursuits of the nerd variety from video games to tabletop adventures and dungeon crawls. Her work is represented by Christa Heschke of McIntosh and Otis. Visit her online at www.sarahglennmarsh.com. I am dying to read this book and so disappointed I wasn't able to fit it into my October reads. Witches are my absolute favorite. I love that this one features strong family ties, it's one of those elements I'd like to see more of in YA novels. Thanks for the wonderful interview, now I'm looking even more forward to picking this one up.